"We walked our horses up to the edge of the mountain and looked over. It was like the end of the world. Far down there was a dreadful drop into a sort of deep valley below. You couldn't see the bottom of it.....On three sides of us was this awful, desolate-looking precipice - a dreary, gloomy, God-forsaken kind of spot." Rolf Boldrewood's description of Starlight's track into "Terrible-Hollow", the bushrangers' hideout in the 19th century classic story "Robbery Under Arms", doesn't concern itself with excessive details of the vegetation. "The trees on the mountain side looked like bushes, and they were big ironbarks and messmates, too." Boldrewood doesn't clearly identify "Terrible Hollow" but the narrative makes it clear that it is located in the southern highlands of New South Wales probably within a days' ride of Bargo. The character of Starlight was based on a real person or persons but whether there was an actual bushranger known as Starlight or a real "Terrible Hollow" is not certain. Despite this, on the southern highlands of New South Wales, just west of the small town of Hilltop, "Starlights Trail" runs for about 4 km down to the Nattai River, dropping about 450 metres. Its grade is relatively easy at the top but becomes steeper for the lowest kilometre. It's a popular track with bushwalkers and doesn't have the menacing nature given in Boldrewood's description. An interesting thing about the trail for Banksia enthusiasts is a distinctive form of Banksia paludosa that occurs at the start of the trail and along its higher sections. Although the trail is regularly used by bushwalkers, many of whom would be interested in the flora, it was not until 1985 as part of the Banksia Atlas project that the "Hilltop" form of Banksia paludosa was noticed. The Banksia Atlas Project was undertaken over three years and involved volunteers all over Australia recording details of Banksia species in natural bush areas that they happened to visit. 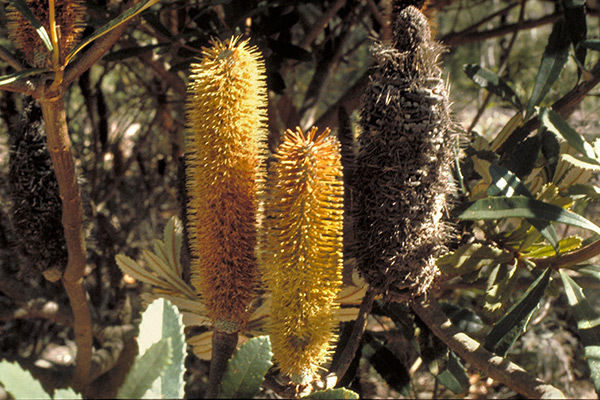 The main aim was to extend knowledge of the natural distribution of banksias but as a result of the observations, several new species and forms were discovered. One of these was the "Hilltop" form of Banksia paludosa. Banksia paludosa "Hilltop Form" opened flowers, buds and fruit. When first noticed in December 1985, the plants were not flowering but they were immediately recognised as being distinctive. Initially the plants were thought to be a new population of Banksia conferta var.penicillata, known only from the Newnes Plateau in the Blue Mountains about 150km west of Sydney and some 160km north of the Hilltop plants. The two populations were certainly similar to each other in being medium to large shrubs without a lignotuber and with broad leaves to about 200mm in length. The main difference between both populations and typical B.paludosa is the lack of a lignotuber. The initial identification was confirmed by Alex George (who, in 1983, completed the botanical revision of the genus Banksia) subject to sighting flowering specimens. In April 1986 Alex visited the site in company with several members of the then Society for Growing Australian Plants (now the Australian Plants Society). The plants were now flowering and it was immediately apparent that they were distinct from B.conferta. The flower spikes were the typical narrow brush of B.paludosa although generally considerably longer in length than is typical with that species. In the final publication of the Banksia Atlas, the Hilltop plant was included under B.conferta var.penicillata but with a footnote by Alex George that it "may have a closer affinity to B.paludosa". Since that time, the Hilltop plant remained without any official scientific name but in 1996, Alex George published it as a new sub-species of Banksia paludosa. Alex often applies imaginative names to plants and his choice of name here is no exception; Banksia paludosa subsp astrolux ("astro" = star; "lux" = light). To date B.paludosa subsp astrolux has not been widely cultivated. I have been growing it for around 8 years in western Sydney where it has proven reliable but has only flowered spasmodically. It may be that the garden conditions where I have it may be too dry; no artificial watering is used and the area is extremely well drained. It would seem to have potential as a quick growing plant for public and private landscaping. The plant is easily propagated by seed and cuttings are also successful. What I find most interesting about this whole exercise is how a distinctive plant can remain unrecognised for so long. There can be little doubt that many of those who passed along Starlights Trail over the years would have had sufficient knowledge to recognise the plants as distinctive. This is yet another example that confirms that there are still plants in the Australian bush, and not necessarily in remote areas, to be discovered by observant people. A more recent (and far more spectacular) example of this was the discovery of the "Wollemi Pine" (now Wollema nobilis), a living fossil discovered by a park ranger west of Sydney. B.paludosa subsp.astrolux hasn't been known long enough to have gained a common name. My nomination is "Starlight's Banksia"....it has a bit of a romantic ring to it, don't you think? George, A (1996), The Banksia Book, 3rd Edition, Kangaroo Press in association with the Society for Growing Australian Plants. Jones, W, Hill, K and Allen, J (1995), Wollemia nobilis, a new living Australian genus and species in the Araucariaceae, Telopea, Vol 6 (2-3), March- September 1995, Royal Botanic Gardens Sydney. Taylor, A and Hopper, S (1988), The Banksia Atlas, Australian Flora and Fauna Series, No.8, Australian Government Publishing Service. Walters, B (1988), Banksia paludosa - Nattai River Form, Banksia Study Report 8, Society for Growing Australian Plants. Originally published in Australian Plants online, ASGAP's internet-based magazine, March 1997. For more information on the banksias, see ANPSA's Banksia section of the website.